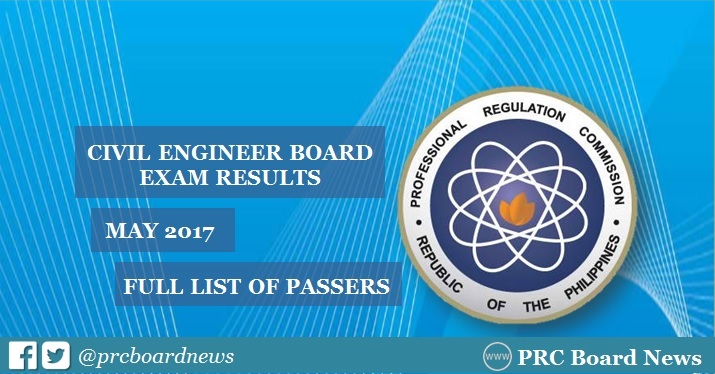 (Updated May 11) The Professional Regulation Commission (PRC) and the Board of Civil Engineering officially released results of May 2017 Civil Engineer (CE) board exam today, May 11, or in 3 working days after the exam. The complete list of passers, top 10 (topnotchers), top performing school and performance of schools are all available here as announced online. UPDATE: 2,514 out of 6,998 passed the Civil Engineer board exam. PRC administered the board exam on Sunday and Monday, May 7 and 8, 2017 in the cities of Manila, Baguio, Cagayan de Oro, Cebu, Davao, Iloilo, Legaspi, Lucena, Pagadian, Tacloban, Tuguegarao and Zamboanga. Civil Engineer board exams cover the following major subjects: mathematics, surveying and transportation engineering (Day 1), hydraulics and geotechnical engineering (Day 2) and structural engineering and construction (Day 3). Based from PRC Resolution No. 2016-1019, the release of Civil Engineering board exam results is on Thursday, May 11 or in 3 working days after the exam. In May 2016 exam, results were released online in 3 working days. A total of 2,245 out of 5,882 successfully hurdled the exams. In May 2015, PRC announced the results online also in 3 working days. The Commission named 1,361 out of 4,311 who have passed the tests. Meanwhile, results of the 2014 CE board exam were announced in just 2 working days. 1,862 out of 4,289 passed the exam. PRC added that successful examinees should personally register and sign in the Roster of Registered Professionals. All takers may verify their rating online in few days after the release of exam results. On this page (http://www.prc.gov.ph/services/?id=41), enter the required information in the appropriate fields to verify your identity. Note: For quick updates on PRC exam results, you may also visit website of The Summit Express.